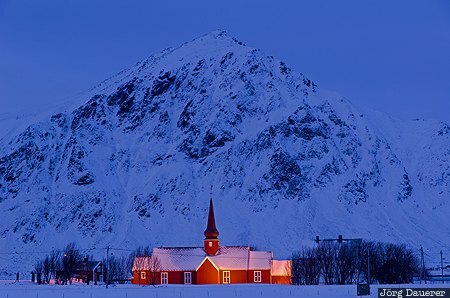 The snow covered and flood-lit red stave church of Flakstad in front of steep mountains on the island Flakstadøya. Flakstad is on the the island Flakstadøya which is part of the Lofoten archipelago, Nordland in northern Norway. This photo was taken in the evening of a cloudy day in March of 2013. This photo was the image of the month in December of 2013. This photo is in the Photo Calendar "Norwegen". This photo was taken with a digital camera.